German composer Ludwig van Beethoven is considered one of the most important figures in the history of music. He continued to compose even while losing his hearing and created some of his greatest works after becoming totally deaf. Ludwig van Beethoven was born in Bonn, Germany, on December 16, 1770. He was the eldest of three children of Johann and Maria Magdalena van Beethoven. His father, a musician who liked to drink, taught him to play piano and violin. Young Ludwig was often pulled out of bed in the middle of the night and ordered to perform for his father's drinking companions, suffering beatings if he protested. As Beethoven developed, it became clear that to reach artistic maturity he would have to leave Bonn for a major musical center. At the age of twelve Beethoven was a promising keyboard player and a talented pupil in composition of the court organist Christian Gottlob Neefe (1748–1798). He even filled in as church organist when Neefe was out of town. In 1783 Beethoven's first published work, a set of keyboard pieces, appeared, and in the 1780s he produced portions of a number of later works. In 1787 he traveled to Vienna, Austria, apparently to seek out Wolfgang Amadeus Mozart (1756–1791) as a teacher. He was forced to return to Bonn to care for his ailing mother, who died several months later. His father died in 1792. In 1792 Beethoven went back to Vienna to study with the famous composer Joseph Haydn (1732–1809). Beethoven was not totally satisfied with Haydn's teaching, though, and he turned to musicians of lesser talent for extra instruction. Beethoven rapidly proceeded to make his mark as a brilliant keyboard performer and as a gifted young composer with a number of works to his credit. In 1795 his first mature published works appeared, and his career was officially launched. Beethoven lived in Vienna from 1792 to his death in 1827, unmarried, among a circle of friends, independent of any kind of official position or private service. He rarely traveled, apart from summers in the countryside. In 1796 he made a trip to northern Germany, where his schedule included a visit to the court of King Frederick William of Prussia, an amateur cellist. Later Beethoven made several trips to Budapest, Hungary. In 1808 Beethoven received an invitation to become music director at Kassel, Germany. This alarmed several of his wealthy Viennese friends, who formed a group of backers and agreed to guarantee Beethoven an annual salary of 1,400 florins to keep him in Vienna. He thus became one of the first musicians in history to be able to live independently on his music salary. Although publishers sought out Beethoven and he was an able manager of his own business affairs, he was at the mercy of the crooked publishing practices of his time. Publishers paid a fee to composers for rights to their works, but there was no system of copyrights (the exclusive right to sell and copy a published work) or royalties (profits based on public performances of the material) at the time. As each new work appeared, Beethoven sold it to one or more of the best and most reliable publishers. But this initial payment was all he would receive, and both he and his publisher had to contend with rival publishers who brought out editions of their own. As a result Beethoven saw his works published in many different versions that were unauthorized, unchecked, and often inaccurate. Several times during his life in Vienna Beethoven started plans for a complete, authorized edition of his works, but these plans were never realized. gradually grew worse. So severe was the problem that as early as 1802 he actually considered suicide. In 1815 he gave up hope of performing publicly as a pianist. After 1818 he was no longer able to carry on conversations with visitors, who were forced to communicate with him in writing. The second problem arose when he became Karl's guardian upon the death of his brother in 1815. Karl proved to be unstable and a continuing source of worry to an already troubled man. 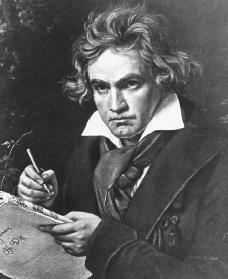 Beethoven's deafness and his temper contributed to his reputation as an unpleasant personality. But reliable accounts and a careful reading of Beethoven's letters reveal him to be a powerful and self-conscious man, totally involved in his creative work but alert to its practical side as well, and one who is sometimes willing to change to meet current demands. For example, he wrote some works on commission, such as his cantata (a narrative poem set to music) for the Congress of Vienna, 1814. Beethoven's deafness affected his social life, and it must have changed his personality deeply. In any event, his development as an artist would probably have caused a crisis in his relationship to the musical and social life of the time sooner or later. In his early years he wrote as a pianist-composer for an immediate and receptive public; in his last years he wrote for himself. Common in Beethoven biographies is the focus on Beethoven's awareness of current events and ideas, especially his attachment to the ideals of the French Revolution (1789–99; the revolt of the French middle class to end absolute power by French kings) and his faith in the brotherhood of men, as expressed in his lifelong goal of composing a version of "Ode to Joy," by Friedrich Schiller (1759–1805), realized at last in the Ninth Symphony. Also frequently mentioned is his genuine love of nature and outdoor life. No one had ever heard anything like Beethoven's last works; they were too advanced for audiences and even professional musicians for some time after his death in 1827. Beethoven was aware of this. It seems, however, he expected later audiences to have a greater understanding of and appreciation for them. Beethoven reportedly told a visitor who was confused by some of his later pieces, "They are not for you but for a later age." Autexier, Philippe A. Beethoven: The Composer As Hero. Edited by Carey Lovelace. New York: H. N. Abrams, 1992. Balcavage, Dynise. Ludwig van Beethoven, Composer. New York: Chelsea House, 1996. Solomon, Maynard. Beethoven. 2nd ed. New York: Schirmer Books, 1998. What about his career?! I mean the information is great, but I would consider making an article just about his career. How was his life as a composer? What effects did his career have on his life? Questions like that should be answered. I appreciate your knowledge of Beethoven, but I believe and article like that that should be included. birthday in 1960. Most of Beethoven's works are in my musical library. Anyhow, it is nice that you honoredt the story. I think Beethoven is the most famous for his work because he inspired me to become a Violoncello and a pianist I have been playing my whole life and, I don't think I could go on living if i don't have his music or his inspiration. He has been in my life since I could play. People think that I'm weird just because I listen to classical music and that i'm a freak show. And I think it is nice to listen to peaceful music and doing something that is relaxing. Beethoven has in packed in my life and I don't anyone getting in my way of that. Stand up for people that are getting bullied and fight for them because I am one of though victims, and I think people should have their own ways in life. The people that need help even if they don't want help I get my help from my friends and family. Beethoven is always going to inspire me Love him and he will Love you back. Im Nadia Alison Gidley and I want the world to have peaceful things to in joy so help somebody out a family member an friends anyone that looks hurt or crushed. Was he ever scared that someone that disliked him was going to try to harm him or hurt him? I have a few questions for you. I need these answers in at least a week. I will be using these for a school project.